Hemachandra Musical Nite is an event that took place on 27-May-2007 in Hyderabad. You can't not know this bro-sis duo. Okay, you can. Summary is, this concert is going to be a lot more entertainment than those complicated sentences. The Hyderabad Boats' Club is celebrating its platinum jubiliee with a grand musical nite by Hemachandra and Himabindu, at the club's premises opposite Hotel Marriott, this Sunday. As part of the celebrations, former Chief Justice and founder member of the club Alladi Kuppu Swamy will be felicitated. The chief guest for the evening is Revenue Minister Dharmana Prasada Rao. Hemachandra and Himabindu are a brother-sister duo who shot into the limelight with the Zee TV Saregamapa Challenge 2005. Both of them learnt music from their mother V Sashikala Swamy, a classical and light music singer for the last 30 years. 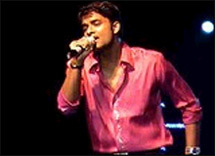 Even though Himabindu exited during the group stages of Saregamapa, Hemachandra made it to the final 4 by winning the votes of over a million television viewers. In spite of losing the contest, he keeps bagging many offers from Bollywood and Tollywood. The Hyderabad Boats' Club was established in 1932 with just 3 members, under funds from the Central Government to the Nizam Maharaja Kishan Prasad Bahadur. Established with an objective to promote social and cultural activities besides to encourage water sports in Hyderabad, today the club has affiliation to over 56 outstation clubs across the country. This celebration year, as part of its social responsibility, it has plans to adopt a slum, and provide education, sanitary and health services to the residents. The celebrations are exclusive for the members only. Please contact 2345-3877 for further details. fullhyd.com has 700,000+ monthly visits. Tell Hyderabad what you feel about Hemachandra Musical Nite!